Bet365 is one of the top brands in all of the online gambling world, and the mobile arm of their online casino is outstanding as well. They are licensed for operation from the United Kingdom and Gibraltar, both of which are top-tier jurisdictions. They’ve been running since 2001, giving them more time in the business than most, and they have one of the most well-rounded operations that you’ll find anywhere for mobile casino fans. The casino bonuses at Bet365 are certainly attractive. They offer multiple promotions that are beneficial for new players and return players. Their offers are subject to change and can be found by visiting their website or mobile app. 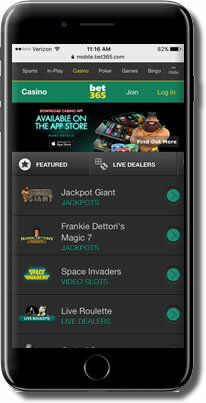 There was a time when each mobile casino would only feature games from a single software provider. However, that time has passed, and the Bet365 Mobile Casino gives players chances to play games from several different providers. Included in the mobile selection is the Microgaming Quickfire platform of games in addition to titles from Net Entertainment, BetSoft, Playtech and some other titles. The Quickfire platform also includes third-party games that weren’t produced by Microgaming, and this includes titles from companies like NextGen, NYX Gaming, Rabcat, Quickspin and plenty of others. The mobile software solutions employed by Bet365 are reliable and efficient and are just one of the reasons we consider this brand worthy of inclusion in our mobile casino app reviews. The mobile interface for this casino is based on the premise that you should be able to connect from any type of modern mobile device instead of having to get a specific device to play at this site. As such, it’s a completely web-based platform with games from several providers, as is mentioned above, and it runs completely in your browser on your smartphone or tablet. It’s a very straightforward way to handle the issues of compatibility since Android, Blackberry, Windows Mobile, iOS and other smartphone and tablet devices will have no problem logging in and running the games. Most of what’s available at any casino these days is slot-based, and that’s also the case with the Bet365 Mobile Casino app. There is a really good selection of hundreds of mobile slots that you can play with this mobile casino, and it’s all set up to make it really easy to sort through the games and pick out your favorite titles. This saves you from situations where you might feel like you have to just keep scrolling and scrolling every single time you want to find the game you like, but that’s not the case at all with the way this app is set up. There are five-reel video slots for the most part, but you’ll also find a good selection of three-reel classic slots as well. There are some of the largest progressive slots in the world available here also, including both Mega Fortune by NetEnt and Mega Moolah by Microgaming. Each of these titles has held the world record for the largest online jackpot ever in history, so it’s clear that Bet365 is offering up an excellent selection of every sub-genre inside of the mobile slots category. This makes this site perfect for online slot fans. To round out that selection, you can also get in on the action with plenty of table games. Roulette, craps and Baccarat make up the foundation of this selection along with several different styles of blackjack, video poker and casino poker, all of which are great for players who are a bit more strategically minded. They also have live dealer games that play out in high-definition video feeds, which are great for those who like the social atmosphere of classic casino games like roulette, blackjack, casino hold’em and Baccarat. You can chat with other players while you tip your dealer and do everything else you might expect in a live casino setting, all from the comfort of wherever you happen to be on your mobile app. Bet365 has won several awards over the years for their customer service, and it’s available every single hour of every single day of the year. They have several different ways of connecting to contact the support team, but the live chat and email options tend to be the most popular. They do have telephone lines available for players from certain areas, but the live chat is the go-to for most players since it’s only a screen tap or two away in most cases on your mobile device. On the cashier side of things, the Bet365 Mobile Casino app puts you in the drivers seat by allowing you to deposit or cash out whenever you want with a wide range of high-quality banking method. These include MasterCard, Visa, Maestro, Solo, Paysafecard vouchers, Skrill, PayPal, GiroPay, Neteller, bank transfers and other options. Your exact selection of available payment options will vary a bit depending on where you are located and which accounts you have available, but you can rest assured that you will have plenty of options no matter what. It’s hard to argue with the reputation that Bet365 has developed, and their mobile casino app is a part of that. They have one of the best selections of mobile casino games and mobile casino promotions that you’ll find anywhere, let alone in the same place. They also have a really long history, and their licenses come from two of the most strict jurisdictions on the planet. If you’re looking for a place to call home for your mobile casino play, it will be very difficult to find somewhere better than this.